We’re pleased to announce our “Let the Wonder Begin” campaign for The California Academy of Sciences just scored these hefty Hermes Awards for creativity and design. Thanks to everyone at Cal Academy for a great team win! 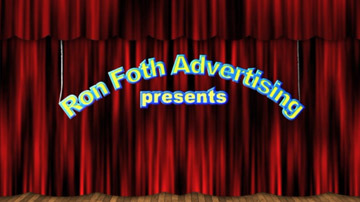 The World Premiere…Foth 5 Second Flicks. That’s right, a story in just 5 seconds. More to come soon! Check it out on Facebook. 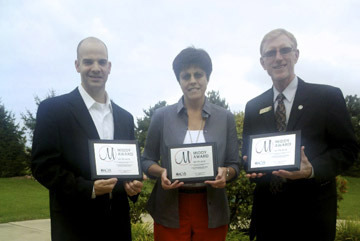 Congratulations to Lake Erie Shores and Islands on winning three Middy Awards for outstanding Convention and Visitors Bureau marketing! 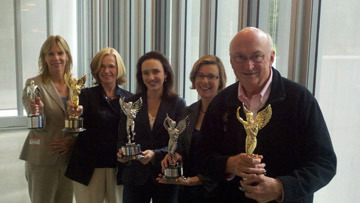 Our campaign, “The Getaway that’s not Far Away,” won best TV commercial, best radio commercial and best print ad. It’s hard to believe it’s been two years since we took this picture. Your boot camp workouts next door have done wonders. My how things have changed. 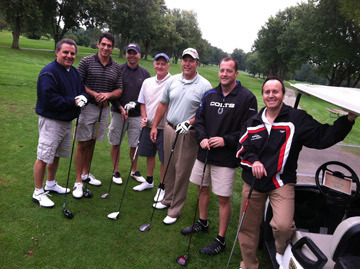 A little rain (make that a lot of rain) can’t stop this team of waterlogged golfers. RFA was proud to be a sponsor of the 2011 Jack Hanna Conservation Cup at Safari Golf Club. 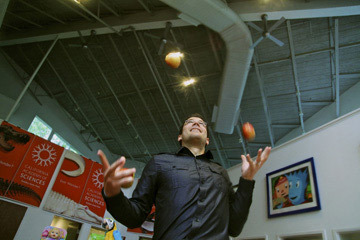 Here’s Blake our new Social Media Specialist attempting to juggle the apples we brought back from yesterday’s Lake Erie shoot (Thanks Quarry Hill Orchards). So, who’s up for applesauce? Somewhere Commodore Abraham Whipple is smiling. (Google him!) We were lucky enough to spend an amazing day cruising up the Ohio River for our latest Ohio Tourism shoot. We also got to check out the historic Lafayette Hotel. Thanks to everyone at the Marietta CVB for making things run so smoothly.